To find Vietnamese, Caribbean, Italian, Ghanaian, Indian, Japanese, Haitian and Korean all under one roof, head to Global Grub Collective. The humble East Atlanta Village food hall hosts a variety of pop-ups or small, more consistent, vendors. Unlike its larger cousins, Ponce City Market and Krog Street Market, the many purveyors do not all offer their goods at once, instead sharing the small space on a rotating schedule. Some vendors, like Ok Yaki and Smok One BBQ, only offer their specialties one day a week. Others, like Mai Kind of Brunch and Mamoune’s Homestyle Haitian, are open exclusively in the earlier hours. The anchor of the space, We Suki Suki, slings banh mis, pho, and bubble tea. They are open from 11 a.m. to 4 p.m. Monday through Saturday. Owner Q Trinh opened the Vietnamese restaurant in 2012. After demand for the space becoming an all-day restaurant, two customers asked if they could operate a taco stand out of the space in the evenings. Since then, the Collective has expanded to include 15 independent concepts. By sharing a space to operate part-time, Trinh supports the smaller ventures and hopes they can eventually branch out into their own buildings. With multiple stalls operating at any given time, the additional foot traffic can give the small businesses much needed exposure. The space feels perfectly suited to incubating the unique, up-and-coming food vendors. What this miniature food hall lacks in square footage, it makes up in charm with brightly painted walls, checkered tablecloths, red picnic tables and string lights that help the space feel warm and homey. Unlike the cavernous size and polished atmosphere of Ponce City Market, eating at the Global Grub Collective reminds patrons of sitting in a friend’s kitchen as they experiment with new dishes. Most vendors offer few options on the menu, but they will not disappoint; anything less than excellent grub would not be in Trinh’s space. One of the more recent additions to the schedule, The Midnight Marauder, makes specialty hot dogs. As “Defender of the Late Night Snack,” they take over the space from midnight to 4 a.m. on Friday and Saturday nights, catering to East Atlanta Village’s lively night scene. So Ko Bonchon, who serves South Korean double fried chicken wings, also adds to the late night offerings. Focusing on local ingredients, the Marauder offers Spotted Trotter all beef dogs and No Evil Foods plant-based dogs on H+F Bread Company buns. Unique toppings, like Doux South’s Drunken Mustard and Simply Seoul’s kimchi, elevate the hot dog from carnival food to a complex, satisfying dish. the dish pairs well with the soft roti rolls. Along with Italian concept Poco Pomodoro, Revolution Gelato is one of the tenants operating most of the time. Open from noon to 9 p.m. every day and an extra hour later on Fridays and Saturdays, the brother–sister venture offers gelato. Despite being dairy-free, their Nekkid Espresso won Flavor of Georgia in the dairy product category at the 2016 UGA Food Product Contest. With a coconut cream base, flavors like Chocolate Fantasy and Orange Dream are rich and intense. 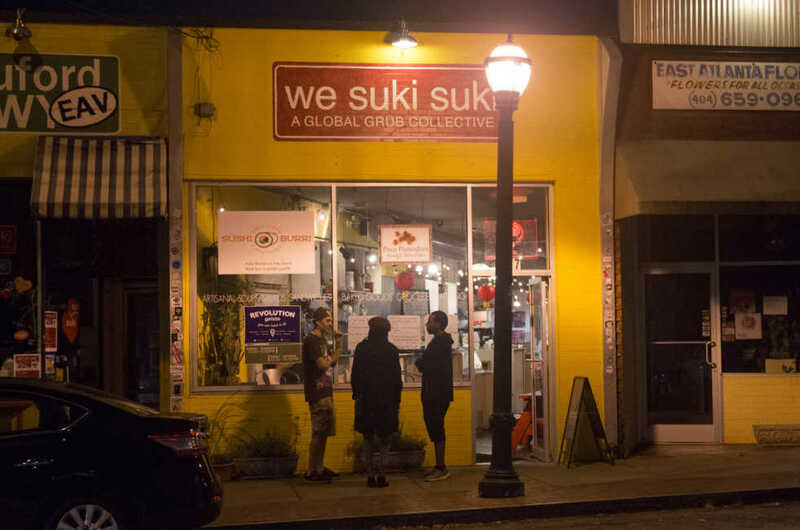 The Global Grub Collective offers alternatives to the authentic international fare of Buford Highway, late night Waffle House runs and traditional dairy desserts. If patrons cannot make it out to East Atlanta Village, multiple vendors use Uber Eats to deliver their goods.